Welcome to today's edition of Nerd Alert, where we have all the off-beat, nerdy news for you in one convenient spot. What do we have in store for you on this marvelous Monday? Jurassic World star Chris Pratt takes his raptor-training skills to a children's hospital, a parkour star honors his late son with an amazing Spider-Man fan film and celebrities offer their best Arnold Schwarzenegger impersonations. We also have the evolution of Iron Man armor. So, sit back, relax, and check out all that today's Nerd Alert has to offer. 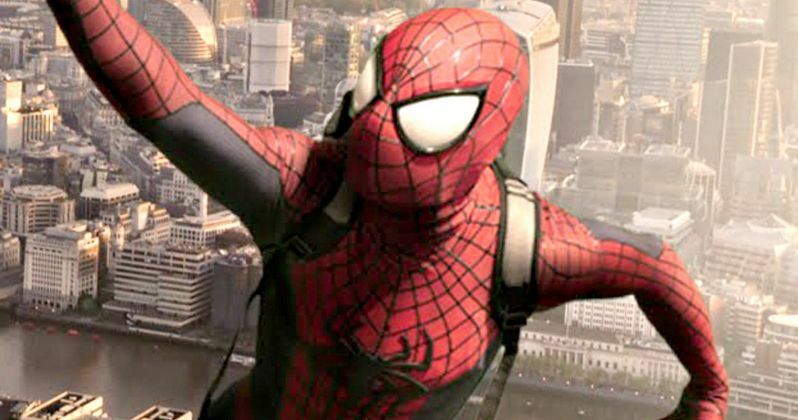 Parkour athlete Mike Wilson wanted to give his ailing son a special gift, by making a Spider-Man fan film entitled The Amazing SpiderDad. Unfortunately, his son Jayden lost his battle with a Grade 4 brain stem tumor known as Glyoblastoma Multi-Forme at Christmas. Mike Wilson finished this amazing five-minute film in dedication to his son, with 100% of the revenue from views and adds going to Naomi House, a U.K. facility that provides support for terminally ill children and their families. We also have a video where Mike Wilson as SpiderDad surprised his son Jayden in costume, before he passed away. Visit the Hope From Jayden campaign website to learn more about this courageous young man and his Amazing SpiderDad. MMToolParts has put together a handy GIF image that shows all of the different variations of Iron Man's costumes in the Marvel Cinematic Universe. It's almost surprising how many different Iron Man suits we've seen in seven years, ever since the first movie debuted in 2008. We'll surely see another version when Captain America: Civil War debuts next year. As Jurassic World continues to break box office records left and right, star Chris Pratt continues to be awesome in his own unique way. Over the weekend, the actor visited the Our Lady of the Lake Children's Hospital in Baton Rouge, Louisiana, where he showed off his raptor-training skills in a photo that went viral after a Reddit user shared it. You can visit Our Lady of the Lake Children's Hospital Facebook page for even more photos. Bryan Cranston made a surprise appearance at this weekend's Electric Daisy Carnival in Las Vegas, where he came out during Above & Beyond's set and delivered a few classic lines from Breaking Bad as his beloved character Walter White. I guess you never know where the 59-year-old actor will pop up next. He also took to his Twitter page last night after leaving the festival, sharing a video of the nearly 100,000 fans in attendance over the three-day fest. It's established fairly early on in Mad Max: Fury Road that the primary resource in this apocalyptic world is "guzzoline," which makes sense since seemingly every survivor has a massive, gas-guzzling car. The Warp Zone has put together a humorous three-minute video that shows what would happen when the guzzoline reserves run dry in this post-apocalyptic wasteland. Made Man brought in Louie star Hadley Delany to deliver a special Father's Day message to her TV dad, Louis C.K., which turned into more of a roast than anything. The actress offers several examples of why Louie is such a unique dad, with numerous clips showcasing his bizarre behavior, as she gets in a few hilarious digs along the way, saying that he "dresses like a homeless Seinfeld." In the beloved British TV series Doctor Who, one of the many tools utilized by the Time Lord is the sonic screwdriver, which can emit energy blasts to take out enemies and heal injuries. Because Science is examining if it's possible to make a real sonic screwdriver that can "manipulate objects from a distance." Surprisingly, there is technology that can cause objects to float in the air by controlling sound waves, although the objects themselves are rather tiny. Still, it's interesting that, in a few years' time, there may be the technology in place for an actual sonic screwdriver like the one we see on the show.